I'm surprised BigPipe aren't peering given how they have clearly made the point of stating they have no ties with Spark's network. Perhaps they are not calling GGI as being part of Spark. insane: I'm surprised BigPipe aren't peering given how they have clearly made the point of stating they have no ties with Spark's network. Perhaps they are not calling GGI as being part of Spark. My understanding is it's all down to politics. when i was testing out cloudflare speeds a while back (before they had sydney pop) texas was way faster than california. i assume california is faster now, but cdn performance is a complex issue, and don't always make sites load faster. i did a little testing with cloudflare to sydney hop, hosting a personal site on it. and i noticed that to sydney there was heaps of jitter in request time. and if i merge with my experience of cloudflare sites in general, speeds for the Sydney pop seem to be pretty bad in general. 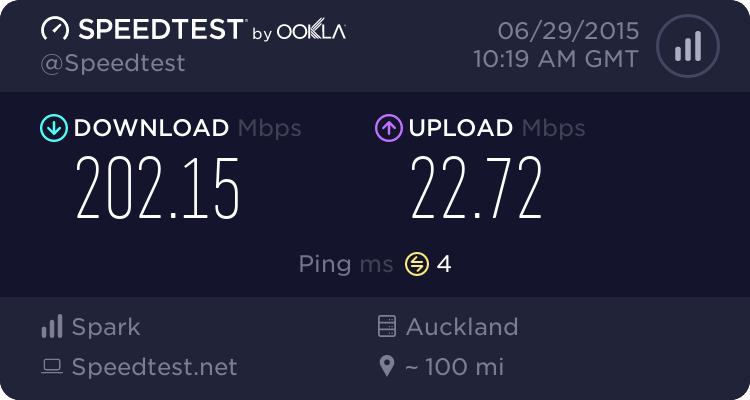 but the speeds to the nz pop seem pretty consistent and fast. it's a double problem as there's traffic from the webserver to cloudflare, and from cloudflare to the end user. and cloudflare just connect from their pop to the destination, rather than carrying the traffic from their local pop. curiously on telecom if you trace to the IP that requests from NZ are coming from... it routes via Sydney and back to New Zealand. So if you use an ISP that peers, the web server still has to send the traffic via Sydney if they don't peer. reddit is a good example of a site that isn't hammered too badly with setup to get in the way of performance, and that seems to have sped up. i'm surprised vodafone aren't peering. i kind of expected bigpipe to not peer. i wonder if spark will peer? if they don't it'd be cool if one of the papers would do an article about it. and how telecom is holding back internet performance for over 50% of new zealanders due to politics. Mynxnet, which I believe is through Vibe. You'e a bit slow Orcon. freitasm: Cloudflare peering traffic charts. I'm sure you're aware, but for others that aren't, that is just a tiny sub-set of Cloudflare's Auckland peering. AKLIX is a very new internet exchange, and as such doesn't have any traffic on it. What we want to see (but can't as they dont release graphs, dont get me started) is graphs from APE. FWIW it seems that Geekzone has sped up a little since. Indeed im hoping at NZNOG conference this week that cloudflare will give us an update with real numbers. It's awesome for local content providers such as geekzone to finally have an affordable global cdn with a presence in NZ. The definition of a CDN is to reduce latency and NZ would have to have the highest latency to the internet in general due to distances to everywhere (places like perth while being further away to US, are closer to asia. So I figure NZ has the most latency to the most places), so you'd have thought we would have more CDNs than we do. Geekzone can now afford to put self-hosted videos on the front page. Vocus... What else would you expect? freitasm: Vocus... What else would you expect? Vodafone must be moving something... Or who knows what, because they are now sending Cloudflare requests to Singapore again (150ms) instead of Sydney (45ms).